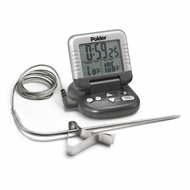 This Polder Classic Cooking Thermometer/Timer has a presettable alarm temperature range form 32 degrees to 392 degrees fahrenheit so that you can use this for all of your cooking needs. The timer and thermometer work simultaneously or individually depending on what you are cooking. It has an extra long high-heat probe wire to help reach any dish. This is a must have for any cook. A wonderful gift idea!